The following is an exerpt from The Miracle of Milk published in 1924 by Bernarr Macfadden. The milk used was, in all cases, the only kind of milk available in those days—raw milk from pasture-fed cows, rich in butterfat. Indeed, the food value of milk can hardly be overestimated. This may be better visualized by remembering that a quart of milk equals in food value three-quarters of a pound of beefsteak, two pints of oysters, eight eggs, two pounds of chicken, three-fifths of a pound of pork chops, or three pounds of fresh codfish. When one is securing, then, from four to six quarts of milk daily (the usual amount taken on the full milk diet) one can see that the body is securing a large amount of most valuable and wholesome nourishment. Owing to the selective action of the cells o the body and because every necessary element is furnished to normalize functional processes and make it unnecessary and practically impossible for the cells to take up an excess of a certain element, all of any particular element that is supplied above the absolute demands of the human economy for wear and tear, maintaining and increasing weight, and repair work is expelled from the body through normal eliminative channels. This is decidedly opposite to the action of the system when given the usual conventional diet. In such a diet the system is not supplied with every requisite element, but receives some far in excess, with few corrective, normalizing elements. The final result is an exhaustion of certain functions and a deposition of toxic elements in certain tissues. When we grasp the significance of these facts we can readily understand that it is more milk, rather than more meat, that the people need, and insofar as the production of meat interferes with the production of milk a great evil arises. Milk is an invaluable food, and every means, not excluding the total elimination of meat as food, should be adopted to increase its use. I have no doubt that our devotion to the fleshpots is the greatest single factor in the present restricted use of milk, which is the most unfortunate phase of our diatetic habits. In fact we could well dispense with the packers altogether, if such a consummation would result in an increased supply and a proper consumption of this most valuable food substance. To answer to the question, “How does milk cure?” we need to know only that it furnishes elements necessary to make new blood. Milk is one of the most easily digested and assimilated foods, containing ample amounts of substances required for the growth of tissues and organs and the repair of worn-out cells. When one is taking the milk diet he does not have to worry about combinations or whether this element or that element is being supplied. Every element is there in the milk of living organic form, and the sick body uses them to the best of its ability – and it is well to say that that ability is constantly increasing as the milk diet is followed day after day and week after week. Milk is the best food in that most precarious period of life – babyhood; and it is also the best food in that other critical period, whether of the babe or adult – chronic illness. Some have said, “Milk is food for babies, not for adults.” This is true, and that is just why we prescribe it for sick people. No sick person is an adult. 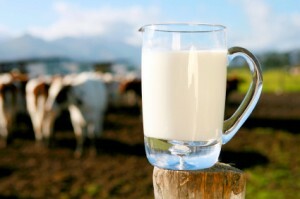 Let him first restore his enervated, functionless, depleted, emaciated, worn-out old body to normal functioning and normal proportions before he claims maturity, and this is done in the large majority of cases more surely, safely and satisfactorily by taking the milk diet than by any other known method.